Tag line: "The most unusual tale of terror - and love - ever told!" I’ve wanted to watch Hammer’s The Phantom of the Opera for a while now, in part to see how it compared to both the Lon Chaney Sr. 1925 film and Universal’s 1943 take on the classic story. But mostly, I was intrigued by the casting of Herbert Lom in the title role. As proficient in comedy (his Chief Inspector Dreyfus was always a highlight of the Pink Panther series) as he was in horror (Mark of the Devil, Jess Franco’s Count Dracula), Lom seemed the ideal choice to portray a complex character like the Phantom, and as expected, the actor did not let me down. It's a December night in the year 1900, and the London Opera House has become the scene of a terrible tragedy: during the premiere performance of a new Opera by Lord Ambrose D’Arcy (Michael Gough), a backstage worker hangs himself. It's so traumatic, in fact, that the star of the show, Maria (Liane Aukin), immediately quits the production, forcing the theater to temporarily close. Some (including Maria) believe the notorious Phantom (Lom) is to blame, though very few have actually ever seen him. Phantom or not, the show must go on, and while holding tryouts, producer Harry Hunter (Edward de Souza) pays particular attention to the lovely Christine (Heather Sears), a novice with an incredible voice. But someone else has also taken notice of Christine: the elusive Phantom! It's after her initial audition that Christine first hears from the Phantom, who promises to transform her into the finest singer in the world. Aided by his mute servant (played by Ian Wilson), the Phantom kidnaps Christine and drags her to his underground lair, where he has lived for years. In his effort to save Christine, Harry (who’d fallen in love with her) does a little research and discovers the Phantom’s true identity, but will this revelation help him rescue Christine, or is she destined to live out her days performing only for her captor? Unlike 1925’s Phantom of the Opera, which concealed the Phantom’s physical deformities until late in the picture, this 1962 version shows its title character’s face before the opening credits. While not as impressive as Lon Chaney’s make-up, the look of the Phantom in this movie is still better, and more horrific than what’s found in the 1943 film. 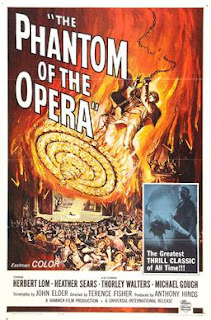 Yet as frightening as he appears, the Phantom is even more sinister when talking; we never see him the first time he addresses Christine, but what he’s saying is enough to send a shiver down your spine (“You will be the greatest star the opera has ever known”, he tells her, “Greater than the greatest! And when you sing, Christine, you will be singing only... for me”). Though at times quite fierce (especially while “training” Christine), the Phantom is also somewhat sympathetic, and Lom does a tremendous job bringing both his madness and his humanity to the surface. In the end, he’s not the most villainous character in Phantom of the Opera (that distinction belongs to Gambon’s Lord D’Arcy), but he’s definitely the most interesting.